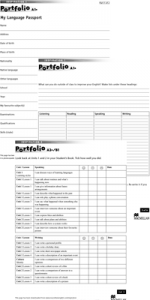 The Inspiration Portfolios are linked to the Common European Framework of Reference (CEFR) and contain valuable exercises that follow the topics of the Student’s Books. Building on the vocabulary and grammar structures presented throughout the course, the Portfolios also help students keep their own personal record of the work they do. The ‘can do’ statements helps students think about how they learn and assess their own progress with self-assessment materials and checklist sections.